Bruce Williams, MS, MSN, RN, CHSOS, CHSE, is the Director of Simulation at St. Vincent Ascension Hospital Indianapolis and has been a registered nurse for 24 years. Bruce joined St. Vincent/Ascension Health in September of 2016, in the drawing revision phase of the Nasser Center Project. Prior to this, he was the Director of Hill-Rom Clinical Simulation Center at Marian University, Indianapolis, IN. Bruce is the past founder of the Southwest Indiana, Western Kentucky and Southeastern Illinois Simulation Consortium Group and currently the lead facilitator of the Indiana Simulation Consortium Group. 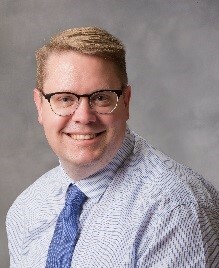 He has a broad background in ICU, ER, Air & Ground Transport, Organ Donation, Occupational & Industrial Medicine and Academic Teaching, and he served as the hospital representative responsible for development and implementation of the William K. Nasser MD, Healthcare Education and Simulation Center. In his role, he was tasked to integrate the technologies, healthcare environments, and academic demands to construct a state of the art simulation center & program.